With Catherine McCoy, an Occupational Therapy Advanced Practitioner working within the Rheumatology Service at Salford Royal NHS Foundation Trust. Due to the specialist services provided for scleroderma at Salford Royal, she has developed expertise in supporting patients to manage the symptoms of scleroderma and works closely with the multi disciplinary team, supporting people to manage their symptoms in order that they can maintain active and enjoyable lifestyles. We talk to Catherine about understanding and managing one of the most frustrating side-effects of living with chronic conditions...fatigue. Fatigue is a common issue for people living with chronic conditions. A study supported by the Scleroderma Research Foundation found that over 75% of people with scleroderma, experienced fatigue, and for 61% of these, it was reported to be one of the most distressing symptoms of the condition. Some people may describe it as 'feeling tired.' It is in fact much more than that. Everybody gets tired from time to time; for most people this is usually after a late night or being particularly busy or active. People living with conditions such as scleroderma, rheumatoid arthritis, fibromyalgia or lupus, can experience fatigue day after day, no matter what they have been doing or how much sleep they get. They can also feel overwhelming physical and/ or mental exhaustion just from doing simple everyday tasks. The effects of fatigue can significantly impact on your experience of pain, your mood and impair quality of life. Symptoms of fatigue can vary over the course of days and weeks. Frustrations relating to the impact of scleroderma on your lifestyle can mean that on a 'good' day you may take the opportunity to do lots of tasks that you have been wanting or needing to do. Unfortunately, the impact if this is often “doing too much" which can result in 'good' days being followed by 'bad' days. You may experience more pain and fatigue as a result of this burst of activity, and consequently are able to do less and need to rest. How can you better manage fatigue and activity levels? 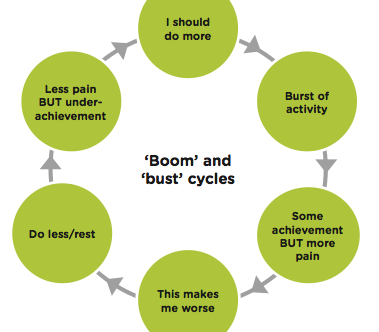 So how can you break into this cycle to better manage your activity and activity levels? 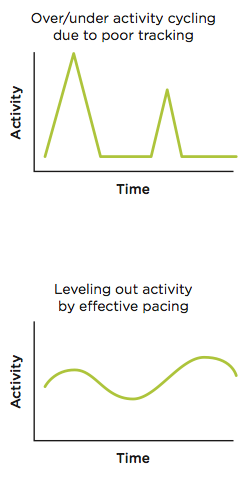 Planning, prioritising and pacing activities can help you to take back control of your energy levels. Take regular breaks, change activities regularly and switch between light and heavier tasks where possible. Is there an easier way of doing an activity? Can you sit rather than stand, push rather than lift etc? Unfortunately this is much easier said than done! To be able to incorporate this into your lifestyle takes practice and effort. When you first start trying to address this using an activity chart can help you to plan your week and also evaluate your activity and fatigue levels. Over time you will find that this becomes habit and it will take less conscious effort to plan your weeks and activities. “I find the idea of colour coding activities really useful. On some days I say to my husband 'I've had too much of a red day...I need some green time' and he knows exactly what I mean"
Fatigue levels in people with scleroderma are believed to be higher when experiencing poor quality sleep, significant pain and low mood. Managing stress and learning how to relax can help to reduce the impact of these factors. Emotional stress causes blood vessels to narrow which can worsen symptoms and effects of Raynaud's. By identifying and managing the causes of stress you may be able to reduce the frequency and severity of Raynaud's attacks. Like activity planning, relaxation strategies take time and practice to master. There are lots of different relaxation techniques and you often need to try a few before you find one that works well for you. While some people like to use relaxation to help them to get to sleep in an evening, it is also a good habit to build relaxation time into your day in order to help manage fatigue. Exercise can also help people with fatigue, if fitness is improved you generally feel fitter, you'll feel an increase in well-being, strength and energy. Starting off slowly perhaps 5-10 mins a day, gradually increasing the amount of exercise or physical activity is the best way to start. Speak to your OT or physiotherapist for guidance and advice.